TOKYO — To Sakura Christmas, borders are where the action is. They are messy places where worlds collide: people, cultures, sometimes armies. And the symbols of change that they signify tell us something important about the values of the shifting societies, about what is retained, what is lost, and how hard people fight to retain what they have. Borders also say much about the new societies that emerge from tumult. Christmas, a doctoral student from Harvard’s History Department, is wrapping up work in the archives and libraries of Tokyo and headed for 10 months of study in Inner Mongolia, an autonomous region in northern China that spans much of China’s northern border. Christmas’ work examines a complex place at a complex time. She’s focusing on the early part of the last century, when Han Chinese migrant farmers pushed into Inner Mongolia, then only thinly occupied by Mongol herders and hunter-gatherers. The farmers’ arrival touched off a scramble for land, a situation that became more complex after 1931, when the Japanese invaded northern China as part of the imperial expansion that was prelude to World War II. The Japanese divided Inner Mongolia into two puppet states, Manchukuo and Mengjiang. For herdsmen, farmers, and even Japanese imperialists, land was an issue, whether as a resource to farm, to graze sheep and cattle on, or to mine. Land and the policies surrounding it, Christmas decided, would provide a useful lens through which to view the region, the people, and the times. Christmas has spent a lot of time in archives and libraries in recent years. She has searched through thousands of documents, photographing or copying those she deemed important. Her research has taken her to three Japanese archives and four Japanese libraries, and has her gearing up to spend the coming months in four far-flung archives in Inner Mongolia. In a way, Christmas has been preparing for her work her whole life. With a Japanese mother and an American father who doesn’t speak Japanese, Christmas was raised at the border of two cultures, learning to read, write, and speak Japanese at home while growing up and attending high school in North Carolina. When she arrived at Harvard in the fall of 2003, she was hungry to learn more about Japan and East Asia. But studying Japan by itself wasn’t satisfying for her. Regular visits to her Japanese grandparents had made the country familiar to her, and not that much different from her U.S. home. Christmas was drawn instead to the region along China’s northern border. She spent the summer after her sophomore year on a fellowship that had her drawing political cartoons — she’d always had an artistic bent — for a newspaper in Mongolia, the nation landlocked between China and Russia. After her junior year she took a year off to study Japanese at Kyoto University on a fellowship funded by the Japanese government. Despite her informal training at home, she felt she needed to improve her Japanese reading and writing skills if she was to conduct research in the language. Three documents unearthed by Harvard doctoral student Sakura Christmas during research at archives in Tokyo. Christmas is conducting historical work there and in China to shine light on the Japanese empire’s expansion into China. Click on the audio clips below to hear Christmas discuss the documents and their significance to her work. On her return to Harvard, Christmas did her senior thesis on Japan-occupied Manchuria, an area in Northeast China encompassing part of Inner Mongolia. After graduating, she spent a year teaching English in another part of China, Xinjiang, an autonomous region north of Tibet, with the nonprofit group Princeton in Asia. Christmas was there when deadly rioting broke out in the restive region, and grew concerned when some friends got caught up in it, though thankfully they were unharmed. Mark Elliott, the Mark Schwartz Professor of Chinese and Inner Asian History, advised Christmas on her senior thesis and later became, with Associate Professor of History Ian Miller, an adviser on her doctoral thesis. Elliott, who’s known Christmas for seven years now, described her as energetic and cheerful, a good student who works hard and takes advice, but who also has the ability to balance advice against her own instincts. After receiving her undergraduate degree, for example, Elliott knew Christmas wanted to teach for a year in China. Since she was interested in Manchuria, he suggested she go to Dalian, a port city with clean air and a fascinating colonial history, where people were known for having more liberal attitudes. Christmas started her doctoral work in the fall of 2009 with an idea of the time and place she wanted to study. Elliott and Miller helped her settle on land as a focus for her interest in the region. In addition to Japanese imperial policies and the day-to-day use of land by herders and farmers, the emerging role of science in measuring and analyzing land is also important, Christmas said, so her work will include an examination of the role of science, as well as environmental aspects such as desertification from careless use. When asked about key moments in her work, Christmas talks about unearthing documents like the record of the 58,000 head of livestock the Manchukuo puppet government bought from Mongol herdsmen after losing a 1939 border battle with the Soviet Union. The loss shifted the border, placing the herdsmen’s winter grazing grounds in the Soviet Union. The Manchukuo government decided it was better to pay for the sheep and cattle than have people fighting over the grazing lands that remained, but Christmas said that decision ignored the central role that livestock played in the lives of traditional herdsmen. For example, Christmas was originally going to include a chapter on opium cultivation, but found that, because it is illegal, people didn’t want to talk about it and documents were hard to find. After turning up references to licorice extraction, she substituted licorice for opium, as the story of licorice in the region allowed her to cover much the same ground. Licorice is found in the deep roots of the plant and its harvest, if done carelessly, can lead to desertification in a fragile, dry environment. In addition to environmental impacts, Christmas will also examine the contrast of licorice’s pre-invasion use as a traditional Chinese medicine — used in root form for upset stomachs — and the more industrial processing by Japan, which extracted the essence from the roots and shipped it for use in soy sauce and tobacco products. As Christmas was wrapping up her Tokyo research in late February, she was looking forward to her stay in Inner Mongolia. Practical concerns were for the moment trumping worries about her research, as she still didn’t have an apartment lined up and was hoping a teacher’s apartment would become available. While the prospect of traveling alone to a place unfamiliar to many in the United States might seem daunting to some, it was something Christmas had done before. 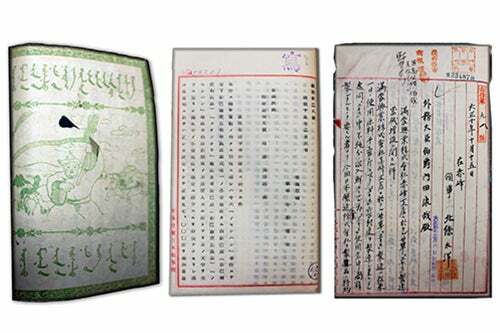 In fact, she was anticipating getting some open time to begin writing while she waited for permission to visit archives in the regional capital of Hohhot and in the towns of Hailar, Qiqihar, and Chifeng. Cardinal Jorge Bergoglio became Pope Francis, in honor of St. Francis of Assisi. “There is a ringing clarity to it that took the world’s breath away. It was worthy of the great poet, the choice of that name,” said author and former Catholic priest James Carroll (center). Joining Carroll in a discussion on “The Papacy and the Catholic Church” were Professor Francis X. Clooney (left) and radio host Christopher Lydon.